This is probably the most awesome sight in the world. 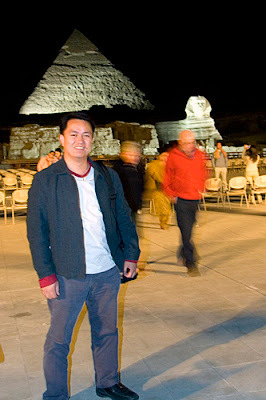 The Great Sphinx with the pyramid of Chefren behind it. You have not been to Egypt if you have not been to the pyramids. The pyramids of Giza, along with the Sphinx, are some of the oldest monuments in the world. 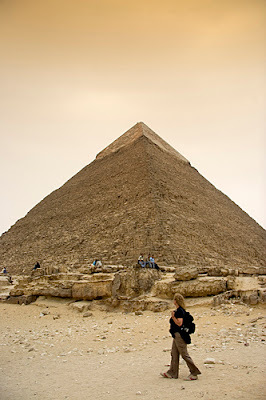 The largest, the pyramid of Cheops, is the last surviving 7 Wonders of the Ancient World. Let me borrow a line from the lights and sounds show; "The world fears time, but time fears The Pyramids." 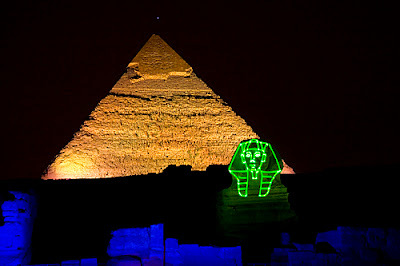 Laser light on the Sphinx and creative lights on the pyramid of Chefren. The lights and sounds show was the first time we saw the pyramids. I cannot find the right words to describe how I felt but I was in awe. It was like going back in time to the dawn of human history. Musicians entertain the guests as they exit after the show. There's really nothing much to the show. It's more of a dramatized tour narration describing the pyramids and a little history. The voice of the narrator & even his style of speaking sounds like a movie from the 1950's then the pyramids, the Sphinx, & ancient walls are used to project images & laser figures. A souvenir shot right after the lights and sounds show. Some souvenirs available for sale at the entrance. The vendors did not mind when I took pictures even if I did not bought anything. Ideally, I would have a tripod for this kind of shots, however, vacation is the main purpose of the trip & traveling light was of utmost priority. It would not be straight photoshoot all the time. In fact, I expected plenty of walking & souvenir shopping on the side so I decided to leave the tripod at home. I've seen light shows before and basically the techniques you can use is not that much different from shooting fireworks. But since I did not had a tripod, I resorted to using handheld shots, high ISO settings, a little under exposure, & holding my breath to minimize movement as much as I can. I did not take too many shots considering my predicament but I did manage to get a few decent shots. For an additional fee of Egyptian Pounds (LE) 35, you may bring your video camera & record the entire show. Fellow tourists at the base of Chefren's pyramid. This should give a pretty good idea of how huge these pyramids are. The following morning was when we had our closer look. The weather that day was not very good. It was windy and naturally, dusty. A sandstorm looms in the horizon. Nevertheless, we decided to proceed to the foot of Cheops' pyramid. 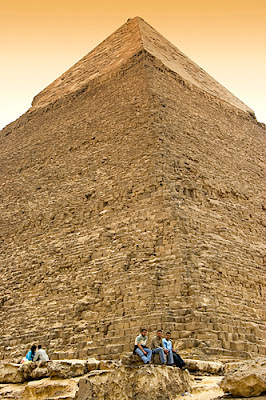 This is the largest of the 3 in the Giza plateau. It was such an immense structure. Each block weighs between 2.5 to 3 tons. A brief explanation was given by our tour guide & then we went on to climb up to a certain level where the general public is allowed. Normal sized steps are carved out of some 1 meter high blocks to make access safer & more convenient. Entry is allowed for a fee of 100 Egyptian Pounds. We would have gone in but our tour guide advised that for only 25 Egyptian Pounds, we could go inside the pyramid of Chefren and be able to see the same thing. So we took some video & some photos & went on to the pyramid of Chefren. The triangular entrance is the entrance to the king's chamber in the pyramid of Cheops. Just below it is the entrance opened by the Arabs in the 6th century is now being used as tourists entrance. For LE 100, you can go inside the great pyramid. After taking a few shots outside, we went inside as planned. The passageway was very long, very narrow, very low & very steeply sloped and is the only way to go in & out. This is probably the main reason why cameras (photo or video) are not allowed inside. There's really nothing inside worth protecting from pictures - there's only an empty passage & small empty room in the end, both with plain stone walls. When we reached the burial chamber (I suppose that was the queen's chamber if I remember correctly from lessons learned in college) we discovered that not much air goes in there so we decided not to stay for very long. has heart & back problems. The Giza plateau. 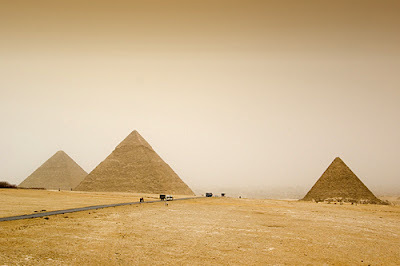 From left to right: the pyramids of Cheops, Chefren and Mycerinus. Afterwards, we went farther back into the desert for a panoramic view of the pyramids. We took a good look did a few pictures and proceeded to the Great Sphinx. Emil suggested a camel ride before going to the Sphinx but with the weather condition not improving, we decided not to. 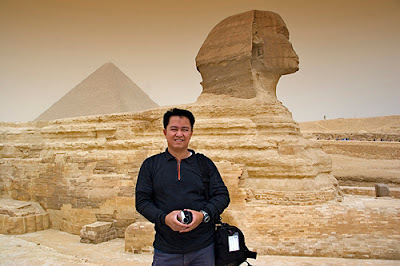 Because of the Sphinx deteriorating condition, tourists are allowed only at a certain distance from it. It's good enough for most type of photos. 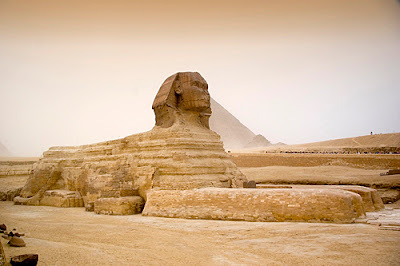 In fact, the designated areas for viewing the Sphinx are the ideal distances for photographing it. Far enough for wide-angle but close enough for close-ups. 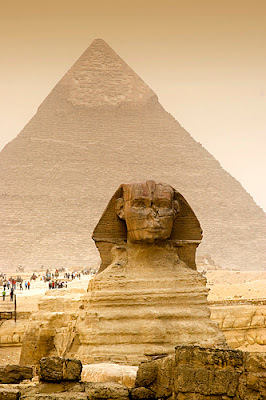 The Great Sphinx is made of limestone and stands guard in front of the pyramid of Chefren. After we've satisfied ourselves with lots of photos & video, we decided it was time to go to our next destination for that day and walked towards our transport. By that time, the wind started to blow harder. 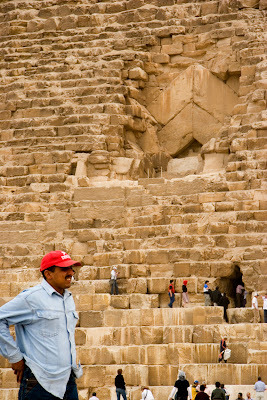 With only a few steps before reaching the van, I turned around to have a last look at the Sphinx & the pyramids. The sandstorm has now made the Sphinx hardly visible. The Great Pyramids? They're totally gone. I was thankful that we did not take that camel ride. We would have been stranded in the desert instead of being comfortably protected inside the air-conditioned van as we went on with our tour. 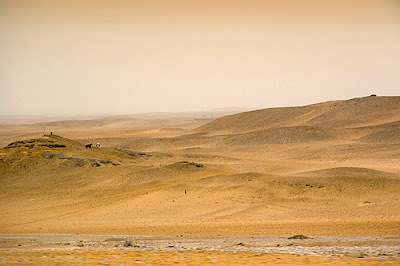 We would have been stranded in the middle of this desert had we taken that camel ride. A strong sand storm blew full blast just after we finished our tour of the Giza plateau. The rest of the day's destinations are indoor sites (the Museum & local handicrafts shops) so the whole day turned out quite lovely despite the sand storm. When we got there, Emil, our tour guide offered to take a picture of me & my wife together. Since my wife & I almost always travel by ourselves, pictures of us together are rare. I was worried that the picture would come out bad and, in fact, I felt that he pressed the shutter button rather too quickly, without using AF and not taking care with composition. Amazingly, the pictures turned out just fine - well composed & well focused. As a well seasoned tour guide, he must have learned a thing or two from the many other tourists he has given service to. From experience he probably knows now what kind of pictures most tourists are looking for. It was not an ideal day to take pictures with the sand & all but hell, my trusty EOS 20D has gone thru worse conditions & those did not stop me from shooting. So sandstorm or not, I will not be stopped from photographing the most ancient of ancient monuments. Because of the sand storm, the usually blue sky has become white. This provided natural diffusion of daylight. While this is pleasant for portrait shots this is not good for photographing architecture & landscapes especially when the whole scene is dominated by sand, grayish white colors & beige. Not only is contrast significantly reduced, such condition also plays a lot of tricks on your camera's metering & focusing. The resulting photos tend to have washed out colors. To overcome the problems, I did the following. First, I fiddled with my parameter settings & increased saturation & contrast. I left the sharpness to its default setting. Second, I always used fill flash when photographing people to brighten up colors & skin tones. Third, I did majority of my shots with the lens stopped down to f/8 to f/11. I avoided wide apertures to maximize sharp results. Fourth, I used a polarizer filter to squeeze out some contrast from the dull colors of the scenery. I also thought of using either a gray, blue or tobacco grad filters to control some of the glare from the grayish white sky but I didn't had any. So, I avoided taking exposure readings from the sky & composed the photos with the idea of digitally adding those filter effects later on in post-processing. Photographing the Nile River from the balcony of our hotel room with my Canon EOS 20D. Egypt is a photographer's paradise, I think. I said that maybe because I've never been here before and the subjects seem endless to me. Apart from the more obvious ruins of the Pharaonic era, the country offers plenty of interesting photographic subjects. The people, the streets, downtown Cairo, the colorful crafts and souvenirs, the overall landscape . . . It's definitely a place worth exploring. Modern Cairo. My wife and I stood here for a good 30 minutes shooting people, buildings and interesting cars passing by. Some looked at us with curiousity but none, not even the police made an attempt to stop us. I like the Egyptians general attitude towards photography. Not just the government but the people themselves. Most will smile for a photo and at no time did I encounter anyone who reacted offensively for having a camera pointed at them. As for the policies of the tourist spots, photography is virtually unrestricted. Maybe this is the general policy of the Egyptian government. 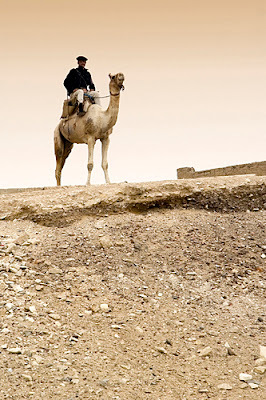 A tourism & antiquities police on a camel in the Giza plateau. Protecting visitors and at the same time, Egypt's treasures. There's plenty of police presence everywhere. In the hotels, in every tourist sites and in almost every street. Before the tour guide takes us out for a trip, an authority asks the driver, where we are going which company they represent, how many tourists do they have with them and what nationalities. Whenever we arrive at any site, the same procedure occurs but they never bother the tourists. An old Lada, Russian-made car. A lot of these cars are still in use as taxi cabs in Cairo. While seeing the sites, hawkers and souvenir sellers will approach and try to be very persistent to an extent but would leave us alone when they sense that we're starting to get irritated. I guess they don't want anybody complaining to the police. I appreciated that. It simply shows that the police presence is there to do what they are supposed to do - and that is to protect the tourists (and the general public of course) and let them have a good time; NOT TO BECOME PARANOID ABOUT TOURISTS AND THEIR CAMERAS. A security guard in traditional dress gladly smiled for a photo. He asked for a tip afterwards which is okay because I would have given him voluntarily. The only place where I was stopped from taking pictures was in one portion of that walk along the Nile River in front of the Russian Embassy so I think the restriction was reasonable. The policeman, who was at some distance gestured politely and smiled. I understood what he was trying to say and so I smiled, gestured my apology, placed my camera in the bag and walked away. Rowers at the Nile River. One place where cameras are totally banned is inside the Egyptian Museum of Antiquities. This is where they put on public display the complete collection of Tutankhamen’s treasures and the mummy of Ramses II. With the number of counterfeiters and thieves out there, the restriction is a well justified measure. Photography, however, is allowed at the front garden of the museum. But before, you go inside the building, you are required to deposit whatever camera you may have to the guards by the gate. 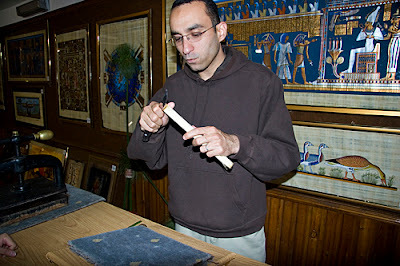 A demonstration on how papyrus paper is made. These papers last for thousands of years. When I was already face to face with the 11Kg solid gold mask of Tutankhamen, I remembered that I still had my SE K800i in my pocket and right then, I felt the strong temptation to sneak a photo. But an angel kind of whispered into my ear not to and so I resisted it. A few moments later an Arab kid, did just that with his Nokia but before he could shoot, a guard in civilian clothes was quick enough to shout "No photos!" and stopped the kid from shooting. I could just imagine how embarrassing it might have been had that been me. Cameras are also not allowed inside the Great Pyramids of Giza. I'm not sure why not considering there's absolutely nothing inside - just empty narrow corridors and an empty tomb. I guess the purpose was to prevent people from staying inside too long while taking souvenir snaps. Without photos, people move constantly in and out. Tourists posing for a souvenir photo at the Pyramid of Cheops. Other than the places mentioned above, photography is open in Egypt. Local people in traditional costumes will even be willing to pose for tourists with a camera. Be prepared to give a tip though. It doesn't matter whether you give him 1 or 100 Egyptian Pounds or any currency, as long as you give him some kind of a tip. 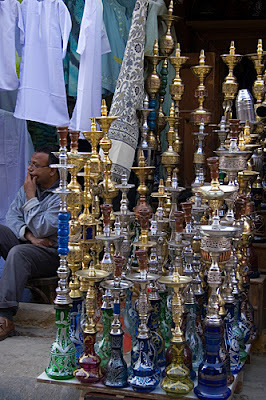 Sheesha bottles being sold as souvenirs at Al-Khalili Bazaar. We bought nothing but the shops welcomed visitors who just want to take pictures. 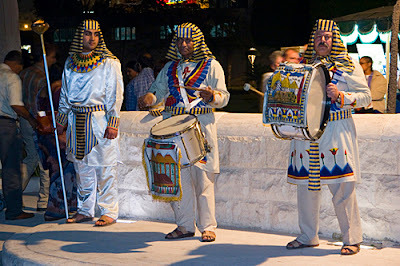 Tourism is Egypt's main industry and source of income. I admire the fact that the people here are not photophobic. Thousands and thousands come and go in this country on a daily basis from all over the world - Europe, Americas, and recently according to our tour guide, a lot from main land China. Have you ever wondered what makes these people come here? I have one good guess - it's the millions of pictures taken by other people who have been here before them. The Great Sphinx standing guard in front of the pyramid of Chefren. On the background is the pyramid of Cheops. Our "Little Adventures" just got a lot bigger this time. No local restaurant, no little anecdotes, or simple stories to share. This time we packed our bags and flew to Cairo, Egypt for a 4-days holiday. Let me share our "big" adventure with you. How do I sum up Egypt? It is perhaps one of the most exotic, if not the most exotic place on the face of this planet. There are just not enough words to describe the whole experience. Culture, history, the people, the warmth . . . I think there's something for everyone. 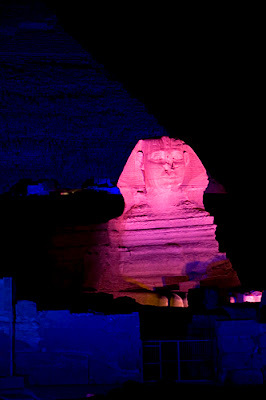 Lighting effects on the Sphinx during the lights and sounds show at night. The single most important reason why my wife and I decided to visit this beautiful place is to see the Pyramids of Giza and the pharaonic ruins and antiquities. We have studied these in school during our elementary and high school days. And then for me and my wife, in college while we were completing our studies in architecture. Laser illustrations and dramatic lighting during the lights and sounds show. For this reason, I've decided not to bore you with the details and history of the sites we've visited. There are already enough documentaries in Discovery Channel and National Geographic, plus the hundreds (or maybe thousands) of books written about them, and then there are also information that you can find in Wikipedia and other Internet sites, and then add to that what you have already learned from school. This article, then, will be about how it was like for us to travel to this land. I will be sharing here what went wrong, what went right and what went great - touristically and photographically speaking. 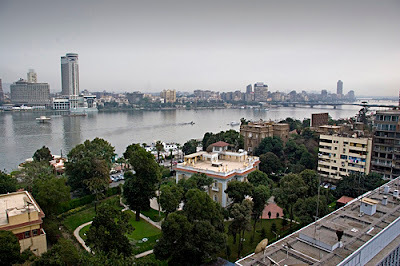 The Nile River as viewed from the balcony of our Sheraton Cairo hotel room. We went to Egypt by availing of one of Qatar Airways Holiday packages. It is true that we have many Egyptian colleagues and friends who could simply give us advise (which many of them did) and give us some kind of a tour plan. Photography is, of course, the other main reason for going there. I wanted a trouble free trip, where I can concentrate on enjoying the sites and taking lots of pictures, so I decided to have everything organized and bought a holiday package. The pyramid of Chefren, the only pyramid that retained the smooth limestone finish at its apex. 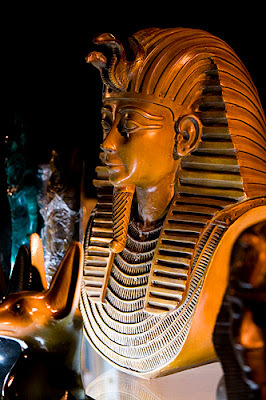 The holiday package we got included airport-hotel transfer and vise versa, a bed-and-breakfast Nile-view room at the Cairo Sheraton, and guided tours to the Pyramids of Giza, Memphis and Saqqara plus the light and sounds show at the pyramids at night. Aside from the light show, all guided tours were scheduled in the morning. It was strange that the Qatar Airways personnel who made our bookings said to us that guided tours are available only on mornings, none in the afternoon. Now, past experiences taught me that airport transport provided by the travel agent is usually late so made sure that I have the local travel agent's contact number on the Egyptian end. It happened to us in Singapore and then again in Orlando - and these people are supposed to be efficient. Egyptian Museum of Antiquities. This is where I "met" Ramses II face to face. It's a shame that cameras are not allowed inside, otherwise I'd have a souvenir photo to show. Anyway, we landed in Cairo International Airport with that expectation, but then, on our way to passport control, I saw this tall dark man holding a placard with my name, "ATIENZA", spelled correctly. I mentioned this because, for some reason, Arabs have difficulty spelling my name correctly. But he got it right. He was on time and gladly assisted us with changing our Qatari Riyals (QR) to Egyptian Pounds (LE). He introduced himself as Mahmoud from Thomas Cook. 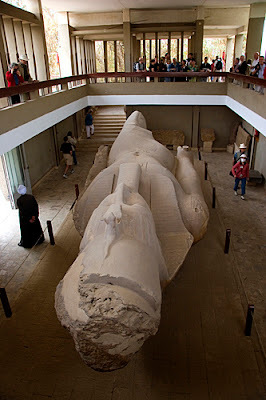 The fallen colossus of Ramses II in Memphis. 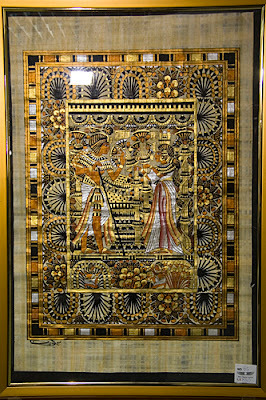 Memphis was the capital of Egypt during the period of the old kingdom. On the way to the hotel, he briefed us on how the tour will go, what time we will meet with the tour guide and then gave us his personal cellphone number so we can call him anytime we need anything during our tour. He also assisted us with the hotel check-in and left us only after we got the key to our hotel room. 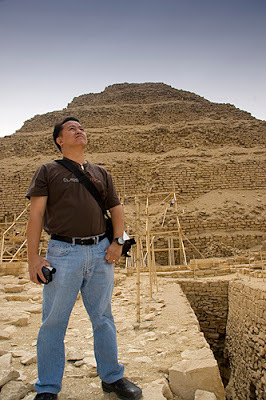 The Step Pyramid in Saqqara. This was the first pyramid ever built in Egypt. It is basically 6 mastabas built on top of each other. Unlike the Giza pyramids, the lime stones used here are much smaller. In all the tours we did (all private tours), the tour guide was always on time and sometimes even early. We felt ourselves trusting the people around us - driver and tour guide. Often times, we had to leave some of our items in the van we were using as transport because they were inconvenient to carry around and we felt confident that it will not be lost, stolen or something. We felt safe. I guess that's the difference between a reputable travel agent and a so so agent. 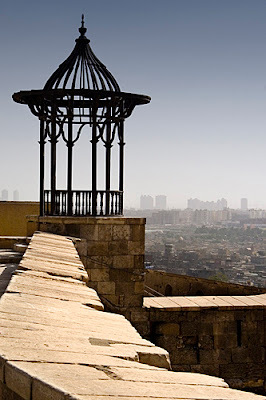 View of Cairo from the Citadel of Saladin. Our tour guide was very good and was able to explain the sites we visited very professionally. On a couple of occasions, we offered to pay for both the driver and the tour guide's lunch but they refused. The tour guide said that they're lunch is already included in the fees that we paid. I liked that. On another occasion, he took us to a buffet restaurant and again, we did not have to pay for his lunch, because tour guides are entitled for a free lunch in that restaurant. Very professional, I have to say. 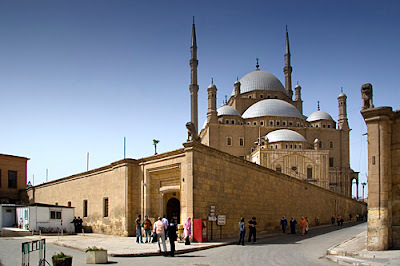 View of the Alabaster Mosque inside the Citadel of Saladin. Those who have seen the movie "Kingdom of Heaven" would remember Saladin as the Muslim leader and nemesis of the Crusaders. The original program that we paid for only included tours in the morning so our afternoons were pretty much vacant. 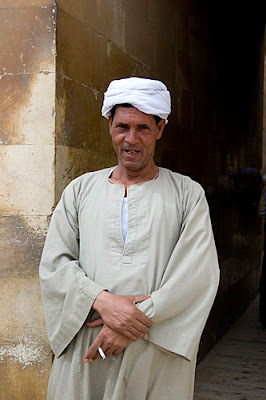 I decided to inquire from the tour guide if it would be possible for him to take us to the Egyptian Museum of Antiquities in the afternoon and to The Citadel of Saladin the next afternoon. He said yes and with that, he called his office to inquire how much for those tours. After informing us, (and we agreed on the price), we proceeded without any paper works, or advance payment. How nice it is to do away with red tape. When it was time to go, again, our transport was in the hotel earlier than scheduled which is a good thing because on our way to the airport we got caught in a huge traffic jam. No worries since we have some time to spare. In the airport, Mahmoud even assisted us with checking in so my wife and I just had to sit comfortably and wait instead of standing and waiting in line. Mahmoud did that for us. Overall, my wife and I enjoyed our trip and would actually consider it as one of the very best trips we've ever had. And the oppotunity to stand right next to the ancient monuments of human achievements is very humbling and quite an experience that is definitely like no other.